Tried to install my Maxtor HDD in my Packard Bell as the main drive to no success. I'm stuck here, but it does get detected if the HDD is connected to the secondary channel with the CF-IDE adapter installed. Spent yesterday cleaning and fixing up my PPC640, and flashed and fitted a Gotek with HxC firmware. I was hoping to leave the Gotek with the built in firmware but the machine wasn't able to read any of the disk images, but worked great with HxC. Bancho wrote: Fitted my Panasonic CD Changer to my SS7 machine today. Hardware wise it is now complete. Just need to get down to Installing software and setting it up. This is a really nice case! Any pics of the inside? Here you go. Its pretty compact. Thats a SB16 CT2230 for reference. 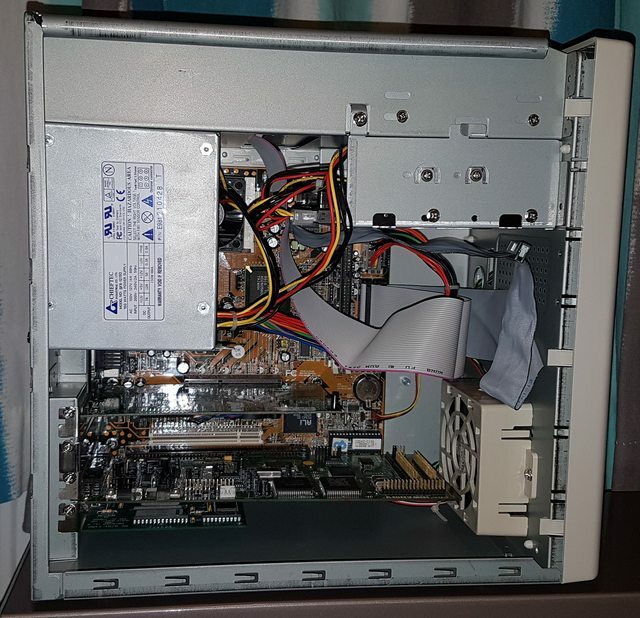 Please note, I need to work on the wiring and i'm swapping the PSU for a FSP 300watt unit. For anyone interested, i took a quick video of my Panasonic Changer in action. It works really well. Quick Press to eject the disk, Long press to change the disk. The software lets you define each tray as a drive letter or group them all under one letter. Nice. What method did you use? Salon creme? Ozone? I want to do this myself soon. 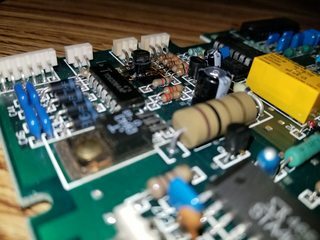 I have been working on a mac se, it did not have its neck board after buying that i found the psu was toast. I suspect a few caps, but since another psu on ebay costs $30 i am not 100% on what way to go. Fixing psu's is one of my weak points.. dc I have no issues with, ac is not my friend. I did run a test by pulling the wires from the psu and attaching them to a regular atx psu and the thing booted, had to open the hdd and give it a little love but the whole thing works! Started testing some MFM hard drives to sell on ebay. First one was an IBM WD12. 10mb in a compact 5.25" full height case! Probably fixable as the mechanical part sounded perfect, but for now it goes onto the healing bench. Was testing memory on an XT machine tonight and its built-in diagnostic tool shows all 640K as testing ok. I run Checkit v2.1 and its memory test shows a spot that is bad in memory. I replaced all the DRAM and reran the Checkit memory test. Still shows same spot as bad. Have any of you run into this with Checkit? swap chips. if the error remains in the same place, it is an issue with the board. You might have a flakey socket or cold joint. luckybob wrote: swap chips. if the error remains in the same place, it is an issue with the board. You might have a flakey socket or cold joint. That's what I was dreading. The board actually has a built-in diagnostic rom and I find it odd it does not pick up the problem. Time to disassemble for closer inspection. Didn't do anything with retro hardware, but instead got to play with some newly acquired retro development software. Dunno how many other people here are actually interested in old-school DOS coding. Sure, Open Watcom is a thing and is freely available for download and is probably just better all around ... but I don't care! All the manuals except for the white "Getting Started" one are for Watcom 9.5 unfortunately, but after checking the copies of the 10.0 manuals included on the CD, the 9.5 manuals look to be pretty close overall and certainly will be very applicable. I do very much love me some hard copies of documentation, so that is nice. I had been using a copy of DJGPP from 1997-98 so far for my DOS coding adventures and have been happy so far. But I do like collecting copies of original development tools. After playing with this for a while, I am unsure if I will switch to Watcom or not. From a purely technical perspective, it makes absolutely no sense to switch at all. The version of GCC that comes with even the older version of DJGPP that I have been using is very good. I've not had many reasons to need to drop to assembly so far to get good performance writing graphics code. However, I do also recall that being a commonly touted thing about Doom's development (which built with Watcom). Anyway it does feel sort of "cool" to me to use the same development tools that a lot of DOS games were built with (that infamous "DOS/4GW" banner ... ). Also, while the Watcom editor and IDE (they are separate executables!) feels primitive in some areas, the editor is a bit more sane in some other areas that really matter to me compared to RHIDE (the DJGPP editor). Also I was surprised that the 32-bit DOS executable debugging story for Watcom is more decent then I had previously read ... mixed accounts from various forums from many years back, some claiming it didn't work and some claiming you had to start up multiple DOS boxes manually beforehand. It all seemed to "just work" for me when fiddling with some VGA mode 13h toy code and running it through the debugger this afternoon (though it's maybe a bit slow compared to GDB). Attempted to straighten pins for the 128k x 8 32-pin 20na 5V cache chips I got today, and broke a pin off. Is there a guide for straightening pins that are curved (half circle)? I'm getting the 32k x 8 20ns 28-pin L2 cache someday (ordered on eBay), and the 64k x 1 22-pin 15ns 5V as well as the 32k x 8 28-pin 15ns 5V chips are installed. So I flipped that massive mobo over and boom... corrosion on so many joints. Amazing how the top of a board can look completely different than the bottom of the board. Took a toothbrush and some vinegar and watched all the rust and corrosion melt away, but you were right. The problem socket needs a reflow on some of the joints. At least it's an obvious fix. I hate when you visually can't see anything wrong making fix-it life miserable. for rhe sake of my sanity, put more ram in this thing. it used normal 72pin simms iirc. thats said, it looks nice! 32MB upgrade is on its way! A HUGE thank you to an anonymous source for finding (by complete chance) the VERY hard to find ITT Xtra keyboard for my restoration project. I tore it down and cleaned every nook and cranny and decided against a retrobrite treatment since it does weaken the plastics from what I have been reading. The keys are fairly thin plastic to begin with. I think it looks pretty good even with the yellowing and knowing the internals are completely cleaned out makes me happy with the results. Now onto restoring the rest of the system. liqmat wrote: A HUGE thank you to an anonymous source for finding (by complete chance) the VERY hard to find ITT Xtra keyboard for my restoration project. I tore it down and cleaned every nook and cranny and decided against a retrobrite treatment since it does weaken the plastics from what I have been reading. The keys are fairly thin plastic to begin with. I think it looks pretty good even with the yellowing and knowing the internals are completely cleaned out makes me happy with the results. Now onto restoring the rest of the system.